Mounting a pet door in the lower corner of my sliding screen. In the way of mounting there is a screw (see photo) that is above the bottom track wheel. There are similar screws at the other three track wheels. Are these some type of adjuster screw for the wheels? I took the screw out and the track wheel still seems secure in the frame. The sliding door is at least 20 yr old. Yes the screw moves the roller up and down to square up the screen door in the frame. If you remove it the roller could retract and the door could start scraping on the bottom track. 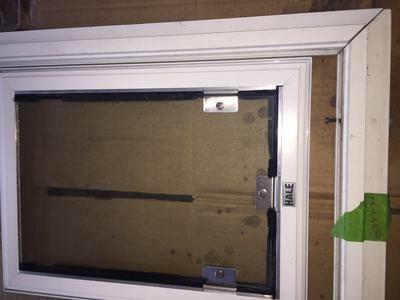 I know it has to come out to make room for the pet door frame but what you could do is drill through the pet door frame so the screw could be put back in its original hole. You might need a longer screw, and if you used a longer screw you would need to grind the sharp point off the end so it does not damage the roller. Actually screwing the pet door frame to the screen door frame is not a bad idea because the pets will eventually loosen up the pet door frame if it is only held on by the screen cloth and spline.